RJ-Romain Jerome welcomes contemporary art. For its first partnership of this kind, the watchmaking Maison has chosen to collaborate with an internationally renowned Swiss artist, John M Armleder. This exceptional encounter between contemporary art and Fine Watchmaking has given rise to ten unique timepieces, all of them featuring a recurrent motif in John M Armleder’s work: the skull. Already featured in mural paintings and as a cut-out on a mirror, this skull inspired by Amerindian culture is now featured on RJ-Romain Jerome watch dials in an unprecedented collection. Manuel Emch, CEO of RJ-Romain Jerome, is a keen collector of contemporary art. He has always admired the work of this Geneva-based artist, who refuses any form of classification of his work, preferring instead a principle of constant ″questioning″ conducive to hybrid interpretations of various genres. The two men thus naturally decided to unite their talents and ideas for the benefit of art. Conceived like veritable works of art, these Art-DNA pieces are made of polished steel. 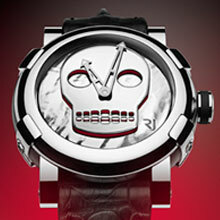 The skull motif applique is raised and serves to decorate the hammered, polished dial. The underside of the applique is lacquered with a colour revealed by a subtle play of shimmering reflections on the dial. Each unique piece is a different colour. The back of the watch is numbered and bears an engraved medallion with the artist’s signature. In 1969, together with two other artists involved in the Fluxus movement, Patrick Lucchini and Claude Rychner, John M Armleder founded the Ecart group. Their ambition was to master all the phases involved in artistic production, from creation to presentation and dissemination of the works. They went on to found an art gallery in 1973 that was also named Ecart. The performances he staged at the time were marked by the influence of Fluxus as well as by a detached and amusing neo-dada spirit. They influenced his approach which played on the integration and disturbance of places. Collage later led him to evolve towards the more geometric abstraction that marked his initial paintings, which were ″freely formalistic″. Associated with the neo-geo trend, from 1979 onwards he developed his own vocabulary combining abstraction with the re-use of furniture, creating pieces midway between painting and sculpture which he called Furniture sculptures. Born in Switzerland in 1972, Manuel Emch studied design at the Art Center in La Tour-de-Peilz before gaining a Master’s Degree in business at Lausanne University’s Faculty of Business and Economics (HEC). The winner of several watch design awards, Manuel Emch is gifted with considerable skills in the field of establishing and consolidating brand identity, which he ably demonstrated at Jaquet Droz, which he revived and repositioned as one of the finest references in the field of Haute Horlogerie. On January 1st 2010, Manuel Emch joined RJ-Romain Jerome as CEO in order to give it a fresh creative impulse and to establish the credibility and reputation of this youthful brand that shakes up the conventions and clichés often associated with watchmaking. In parallel with his activities in the watch industry, Manuel Emch has for over 20 years nurtured a passion for contemporary art and has built up an eclectic collection. A taste for adventure, an all-conquering spirit and visionary avant-gardism merge with the realm of the imagination in the "Titanic-DNA", "Moon Dust-DNA" and "Eyjafjallajökull-DNA" collections. These three worlds exalt contemporary horizons through a resolutely masculine and contemporary touch. From the ocean depths to the immensity of space, from incandescent lava to age-old minerals, the RJ-Romain Jerome collections are far more than just astonishing watches: they define a new era in watchmaking.